Covered in ivory lace, the Bridgette gown is the ultimate romantic statement for your wedding day. Delicate scallop lace edging paired with an illusion high-neck evokes a flattering and elegant Victorian feel. With a slim fit over the hips, and the flare cut into the skirt, it balances the gown and creates a sleek silhouette. Contact the showroom on 0207 680 9716 to order. 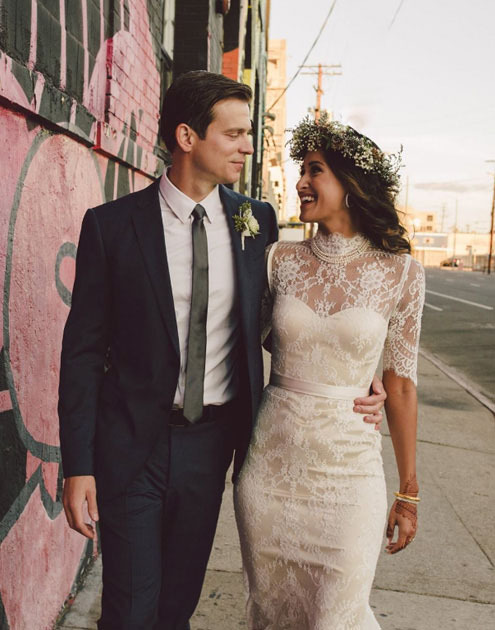 ''I loved my dress and felt so amazing in it on the day''. - Claire. View more gorgeous real brides here.